Beautiful and extremely private single family home in the prestigious, gated community of San Luis Bay Estates. Have you been looking for your Central Coast Dream? These don't come on the market often. Upon entering you will notice hard wood floors, plantation shutters throughout, and nice high ceilings. The main level has 2 guest bedrooms, guest bathroom with decorative tile floors, living room with skylights and tiled fireplace, dining area and kitchen featuring Corian countertops, glass doors, breakfast nook and gorgeous views out of the kitchen window. Sliding glass doors lead you to a deck looking out onto majestic oaks and hills, the perfect spot for your morning coffee or evening wine. Individually lit and carpeted stairs lead you down to the Laundry room with extra storage, Master suite and bonus room including a wood stove for those cold winter nights. Master suite features 4 large closets, master bath with soaking tub, plantation shutters, walk in shower, dual sinks and decorative tile floors. Private deck off master suite. Very low maintenance landscaping, perfect for people who like to travel. Plenty of storage throughout the house and in the 2 car garage. Lots of extra parking close by. 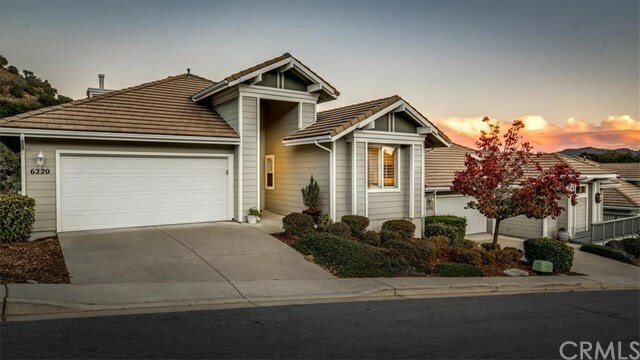 Located in one of the most sought out communities, close to beaches, golf course, fitness & tennis club, restaurants, world class wineries, and all the fun events of Avila Beach!! Directions: San Luis Bay Drive to San Luis Bay Estates Entrance. When through gate, turn right on Lupine Canyon, right onto Sparrow Street, left onto Kestrel Lane.